Our very experienced in house wedding planner Josh Tully recently teamed up with the UK based florists – Flowers By Passion. 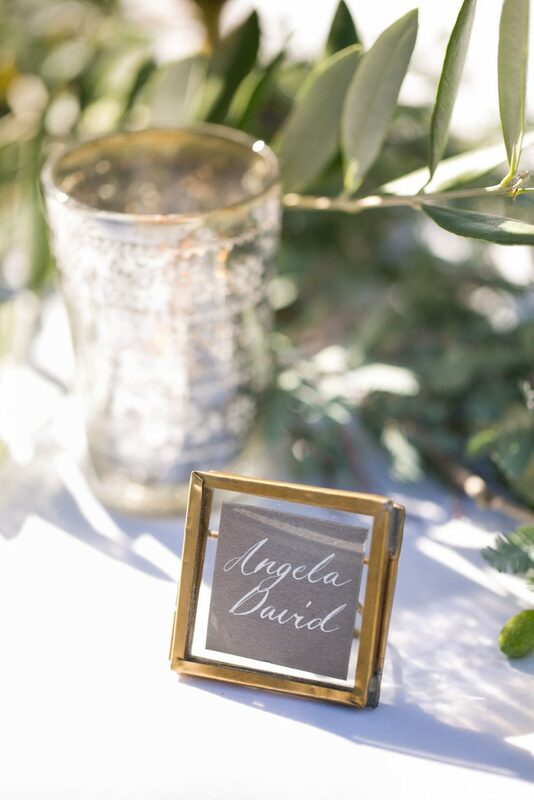 The brief was simple- create 3 different styles to showcase just how versatile La Vue can be as a wedding venue. Below is the thought process behind each look. 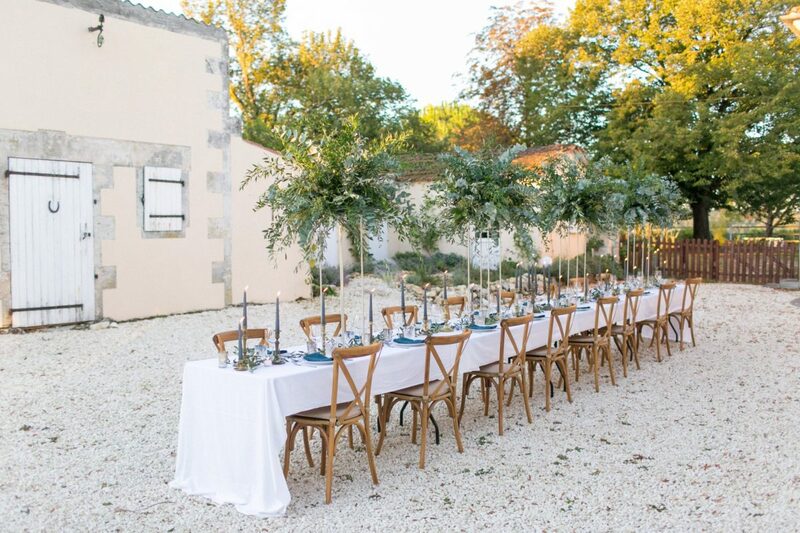 We wanted to showcase a more formal & contemporary dinner setting set within the rustic surrounds of the courtyard. The space is very light in colour which means we were able to use darker tones on the table such as the dark grey candle sticks and navy napkins. 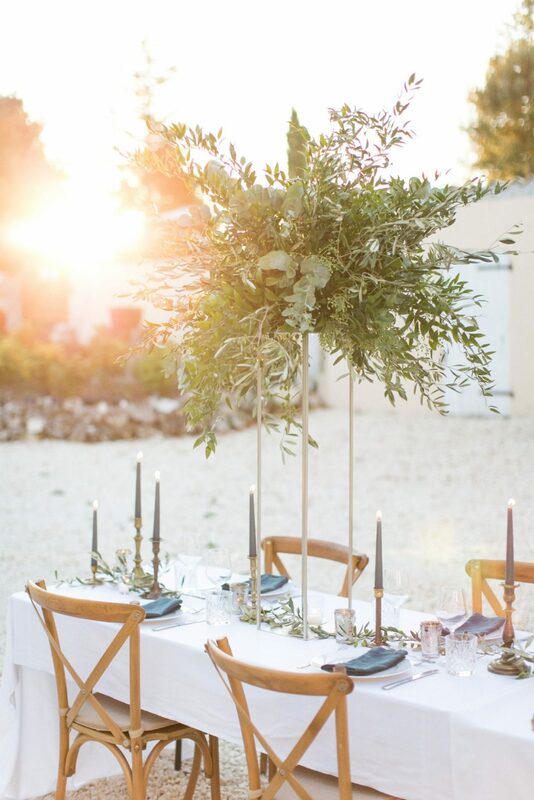 By doing this it created a depth to the space and it adds a subtle glamour to the table. 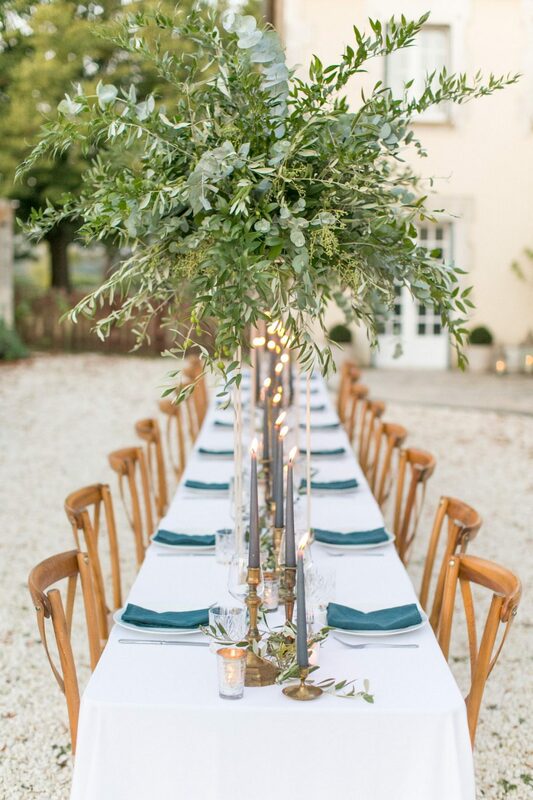 The metal stands in which the foliage sits on are perfect for long tables as it allows the guests to talk across the table, it also adds height to the space which creates a certain type of drama around large buildings. 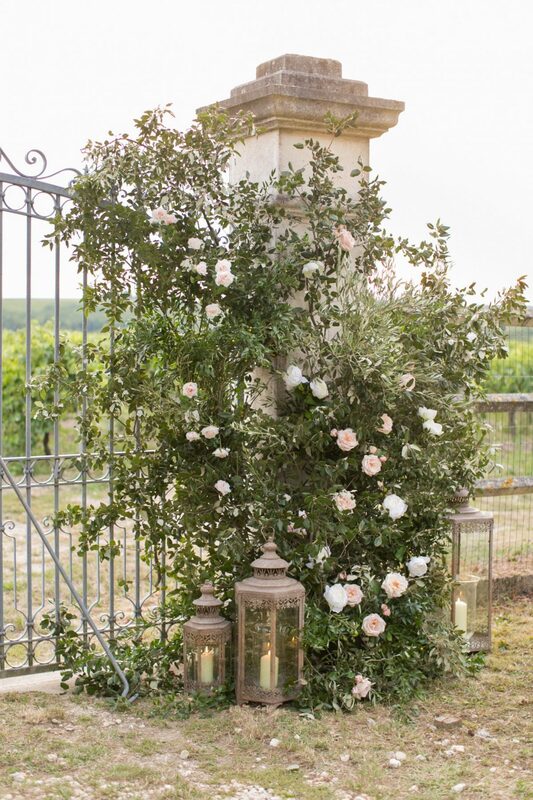 This shoot was designed to be softer and we wanted to simply embrace the surroundings. 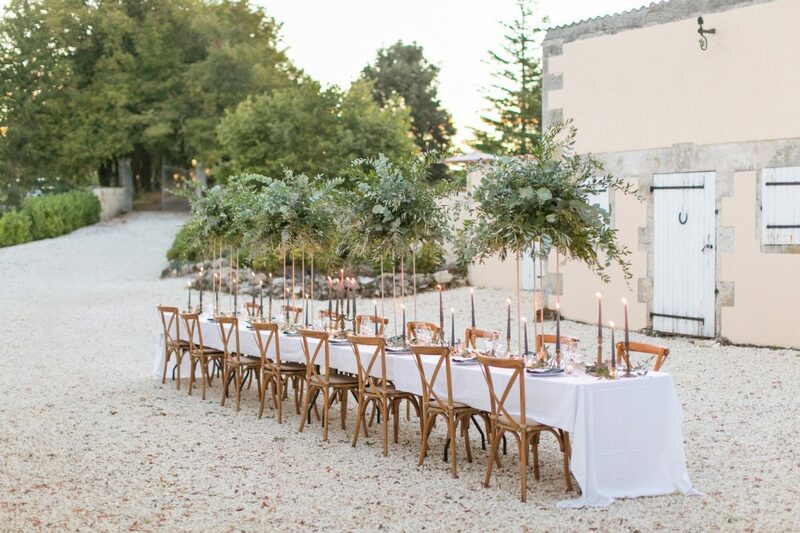 We used dusky colours in the details with a very simple foliage garland rom our garden. 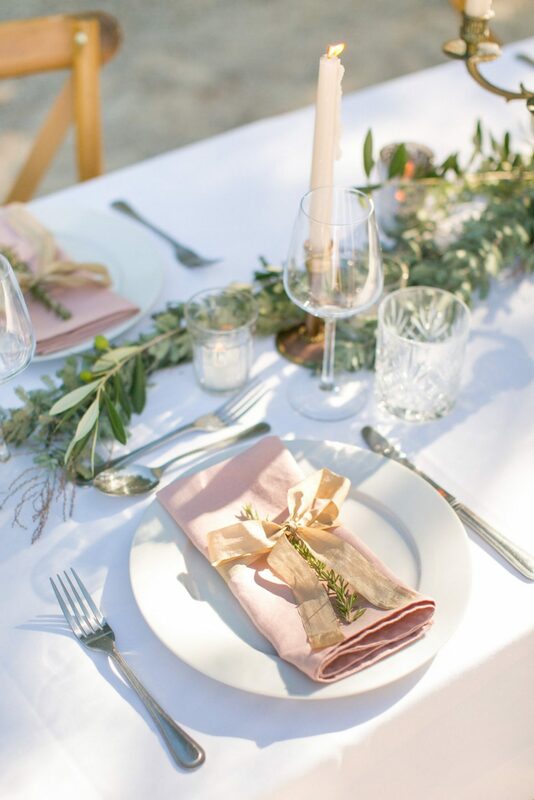 We added a pop of colour with the ribbon which lifts the place setting. 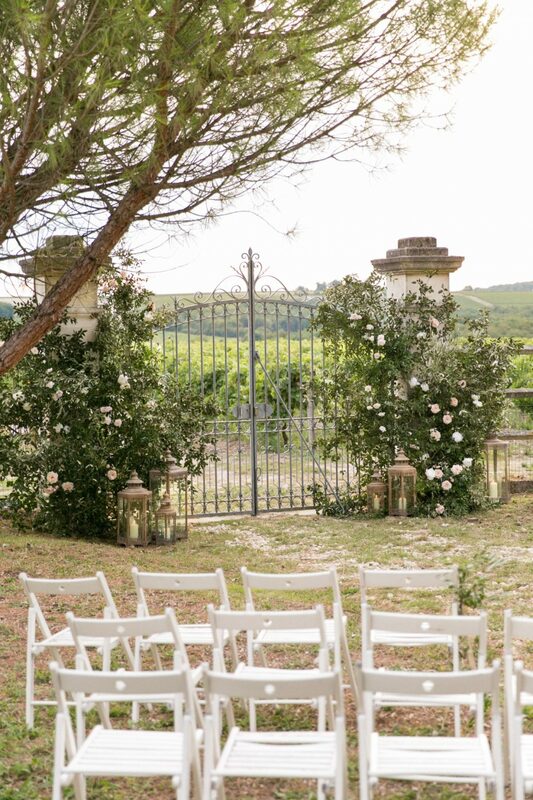 This design is perfect for a more rustic look as its surrounded by greenery, the view across the vines is the focus in this location. 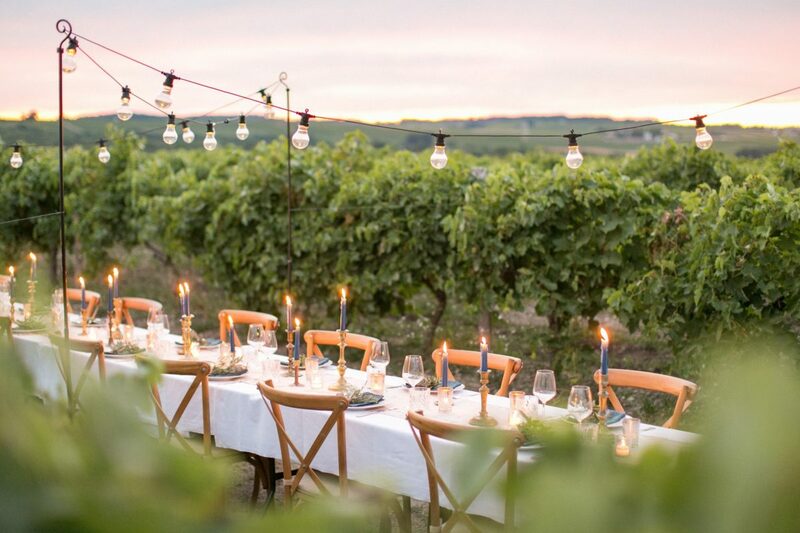 This really is a dream come true for us- ‘dinner in the vines’. 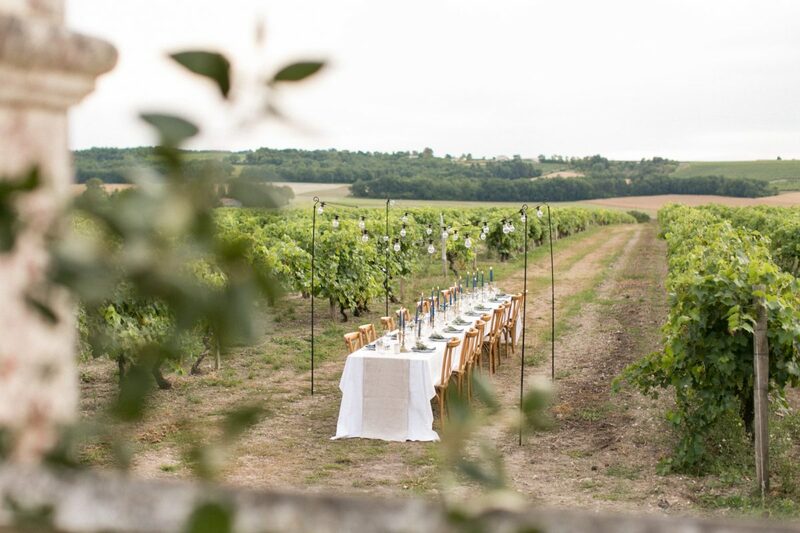 We look across these vines every day and it’s always the spot our guests run too for that ‘sunset shot’ so we thought we have to use this natural space and host a dinner amongst the vines. 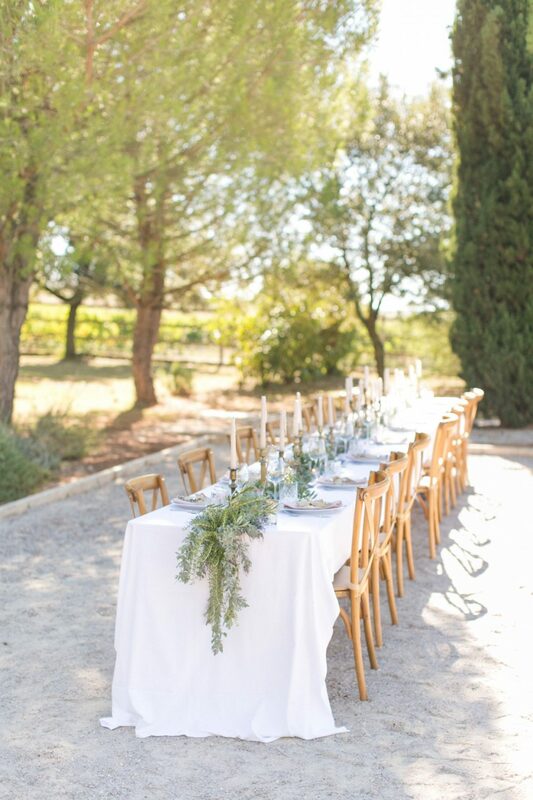 The table design was simple, no florals were needed as you are surrounded by greenery. 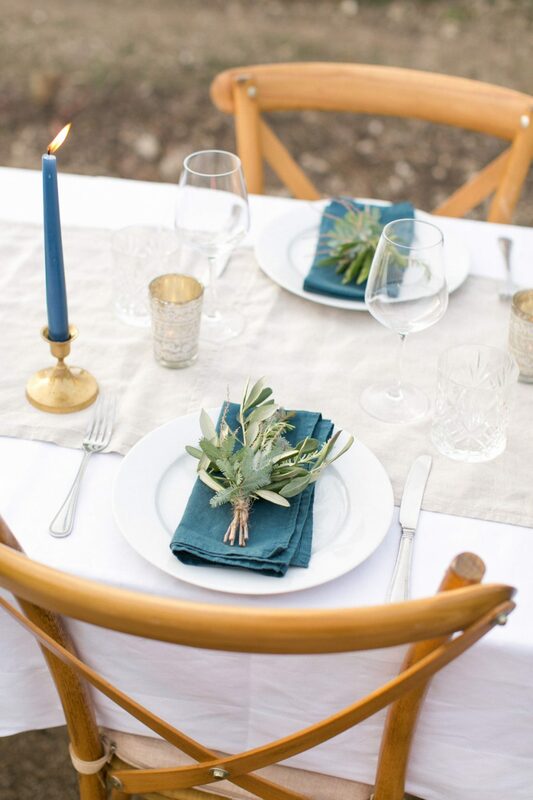 We used a darker candle stick again to add depth and the navy napkins gives the table structure. You really feel as though you are in the heart of the countryside not to mention the gorgeous sunset sky as the back drop. 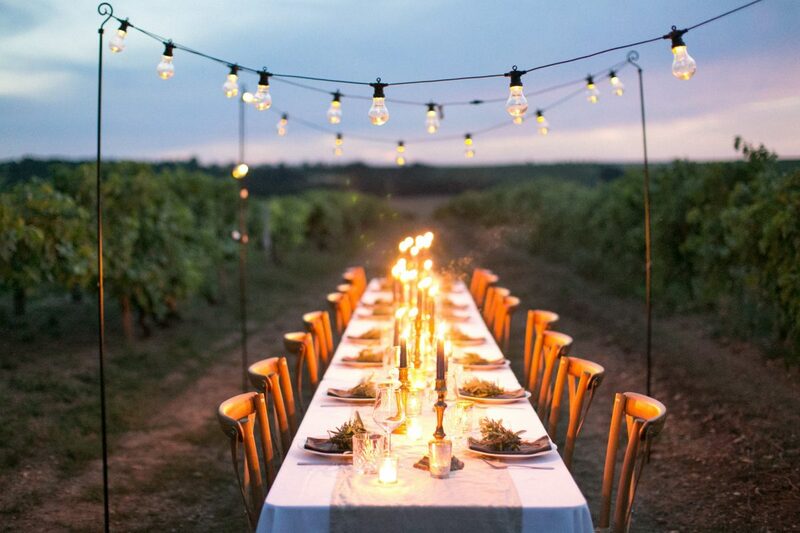 The festoon canopy adds a soft glow as you chat long into the night with your loved ones. It doesn’t really get any better ! 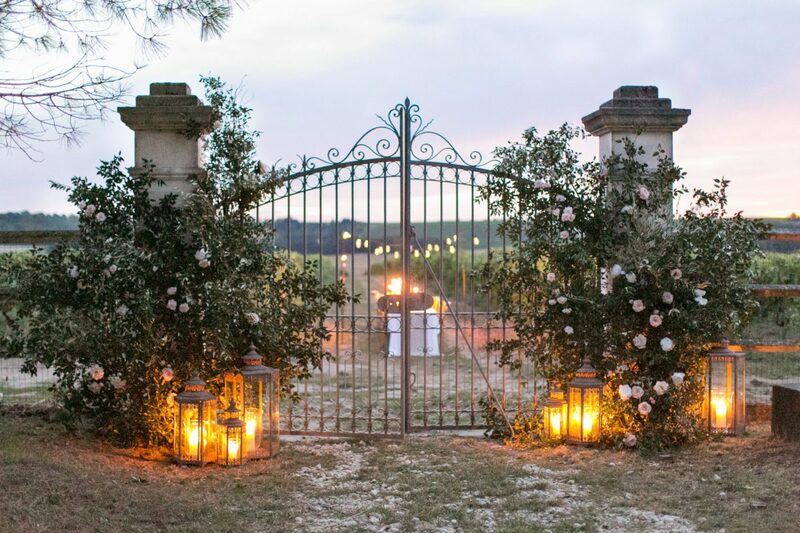 We have always been obsessed with the back gates which is where we suggest as the backdrop for the ceremony. The light across the late afternoon is golden and the floral installation creates a romantic whimsical feeling and brings the space to life. 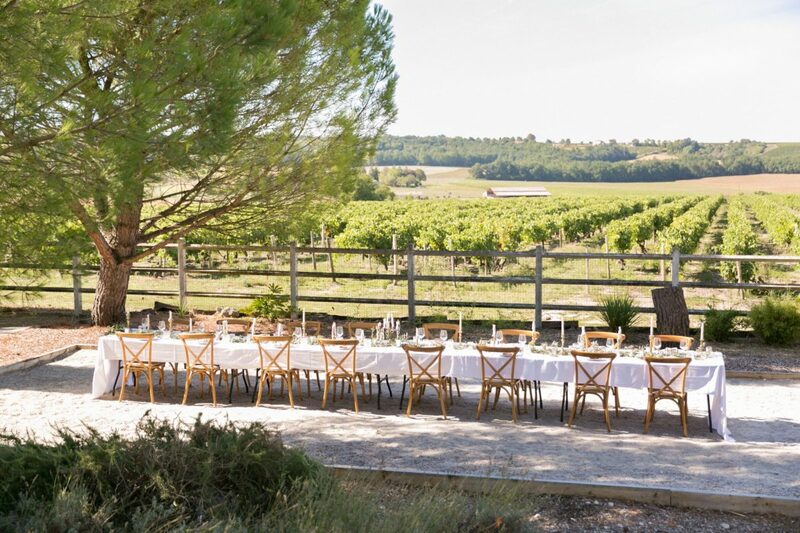 We scattered the chairs into groups instead of the traditional straight lines – this creates a more relaxed atmosphere. 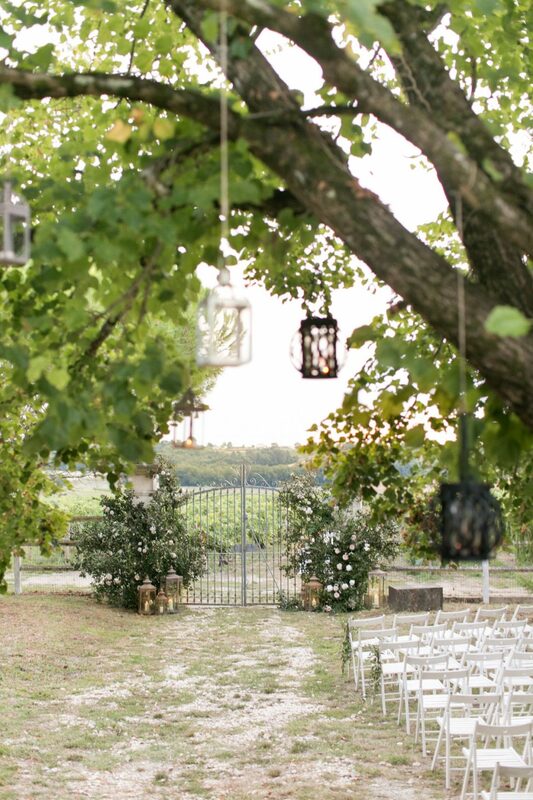 The canopy of greenery offers a cool shade and our lantern tree comes into its own when darkness falls. We chose to shoot three different looks as we are keen to showcase just how versatile the venue is. Each style worked perfectly and the backdrop is ideal for a weekend of celebrations ensuring your guests have the most memorable experience.